Alexie, currently residing in Seattle, Washington, bases much of his writing on his experiences as a Native American. Some of his best known works are a book of short stories entitled The Lone Ranger and Tonto Fistfight in Heaven (1994), the film Smoke Signals, and The Absolutely True Diary of a Part-Time Indian, an autobiographical novel for young adults. In 1999, Alexie was named as one of The New Yorker’s top 20 writers of the twenty-first century. In 2007, Alexie was awarded the National Book Award prize for Young People’s literature for The Absolutely True Diary of a Part-Time Indian. 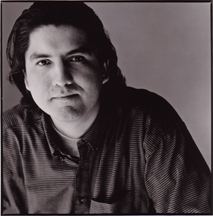 Last year Alexie won the PEN/Faulkner Award for War Dances, the Native Writers’ Circle of the Americas Lifetime Achievement Award, and was the recipient of the Puterbaugh Award and holds the distinction of being the first American to receive the award. The event takes place February 7th at 7 p.m. at the Tempe Center for the Arts located at 700 W. Rio Salado Parkway Tempe, AZ. 8528. Parking is free for guests in the lot adjacent to the facility. No tickets are needed for this event; seating is on a first come first serve basis. Guests may arrive at 6 p.m. and doors to the theater will open at 6:30 p.m. I was really hoping that I would be able to attend this event, but unfortunately I was unable to do so. A friend of mine went and said that it was an amazing talk and I wish that I wouldn’t have had a prior commitment. I haven’t read much of Alexie’s work, but what I have read, I’ve enjoyed. I wanted to go to this really bad, but I have class on Monday nights. I absolutely love Sherman Alexie’s work – his combination of wit and beautiful, realistic writing is unlike any other author’s. I wish I had been able to attend this event!